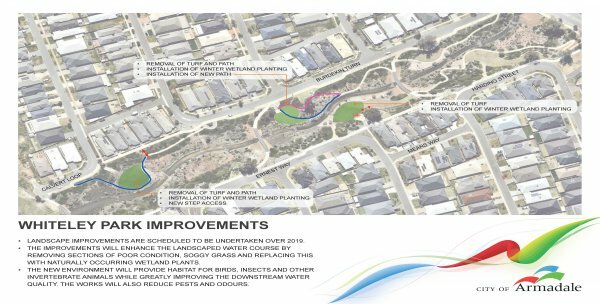 The City's Parks Development team are commencing works within the Whiteley Park/ Water Corporation drain, commencing February and due for completion June 2019. This work is on behalf of the Developer to reinstate the appropriate drainage function in the worst affected areas of the drain base that become inundated for long periods in winter, leading to very poor grass condition/death, loss of pedestrian accessibility and amenity and an increase in nuisance pests (mosquitoes) and odours. Signage was installed in January 2019 informing residents of this work. Remove noted pathway sections and grass edging and dispose of. Turn off or cap effected irrigation stations/sprinklers and pipes in grassed areas to be removed and replanted with wetland planting. Remove affected park furniture and relocate within park. Spray grass areas for removal ( Frog Friendly Round Up Bi-active). Install set of laterite block access steps as noted. Remove noted sections of grass and prepare for winter wetland planting. Install new linking pathway higher up basin banks. The improvements will enhance the landscaped water course by removing sections of poor condition, soggy grass and replacing this with naturally occurring wetland plants. The new environment will provide habitat for birds, insects and other invertebrate animals while greatly improving the downstream water quality.